There are many ways to take a screenshot, edit it and save it to disk. But sometimes I want to take a series of screenshots possibly quick and process them later. Is there a free Windows program enabling me to take a screenshot or desktop (or active window) each time I press PrintScreen or some key combination, and saving each, giving me the possibility to view and process them later, when I'm done? 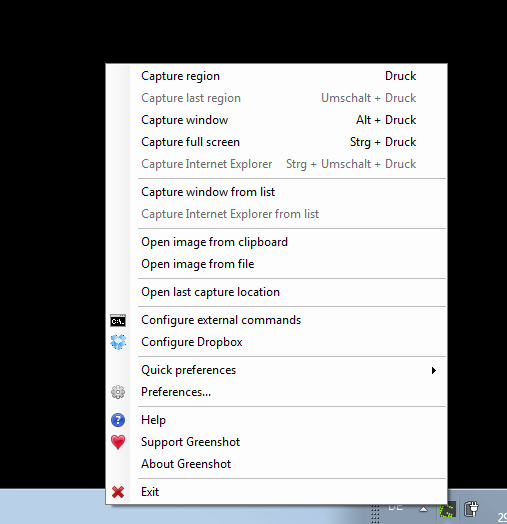 Assuming you're using Windows 8 or above, and want a whole screen screenshot, simply hit + PrtSc. This works anywhere, and is about the only way to get a screenshot of Universal apps. You can find these under your Pictures/Screenshot folder in your user folder. If you are installing a recent version of Dropbox then you get prompted to enable this feature, otherwise, there is a setting in Preferences > Import > "Share screenshots using Dropbox". I use PicPick Portable. It is a very powerful screenshot program and can be configured to work the way you want. 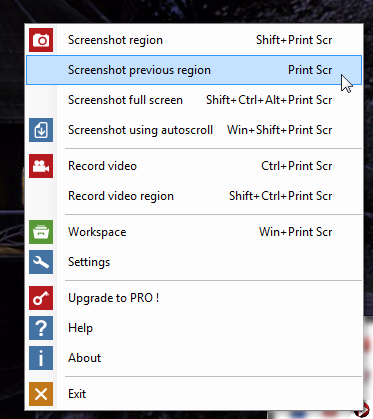 You can set a key like PrintScreen to automatically save screen captures to say c:\Screenshots\Picture[x].png or so. PicPick can capture specific regions of the screen automatically if you use the hotkey for Repeat Last Capture. 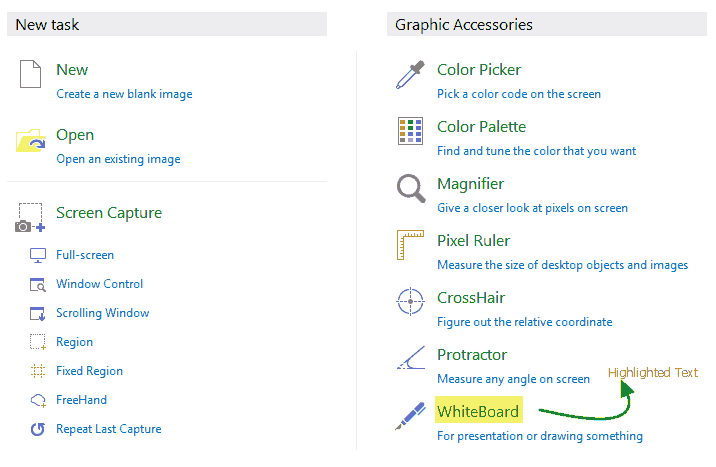 Another great feature is white board which helps you to directly draw on the active window and capture the view if needed. It has got a nice integrated Image editor that offers impressive often very useful features like the highlighter. Overall it is a great program, simple to set up and get used to. I used the free version of Screenpresso to take screenshots for documentation of a web application. I used once Greenshot. You can make screenshots in a series and process them later. It is possible to define a folder where your image should be saved. It has several settings. You can select if you just want to save the screenshot or to use it in any suggested program. A plus is that it can be connected with Dropbox. You can set a key combo which you prefer. I use Lightscreen for this purpose. Lightscreen is gratis, open source software that you can either install on your Windows PC or use as a portable app. You can set up three different hotkey combinations to take screenshots three different ways: the entire screen, a window, or a screen area that you select with the mouse. I've got the output options set exactly the way you describe in your question. When I hit Alt-PrtScrn, it takes a screenshot of the active window and saves the file as a PNG in my C:\temp\screenshots folder with incremented filenames. In addition, the image is sent to the clipboard for an easy Paste into another application. All of this is customizable: You can save as a different file format to any folder you want, and you can choose whether or not you want the image in the clipboard. 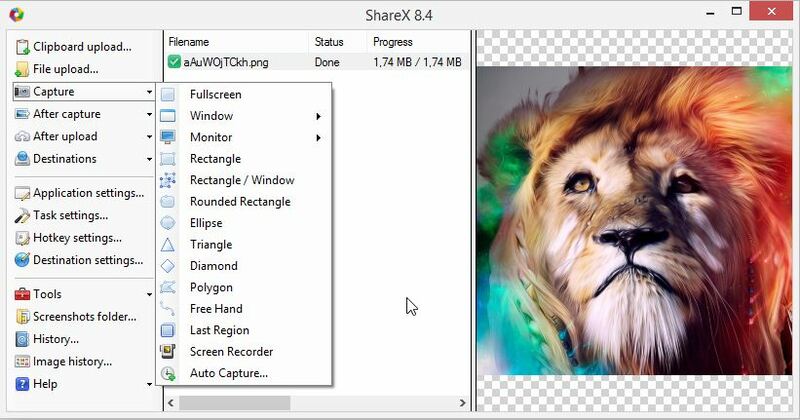 ShareX is a free and open source screen capturing tool for Windows.The tool is portable too so you can run it on your USB drive without installation. It has all the necessary features that would expect in a screen capturing tool. It lets you capture fixed areas on the screen, full application windows or even freehand regions. There’s a built-in editor to help you annotate screenshot images. 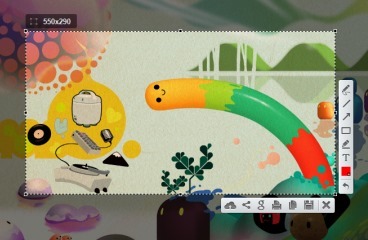 You can create watermarks and they are auto-added to the image after the screen capture is complete. You can configure the app to auto-upload your screen captures to cloud destination like Google Drive, Dropbox, Picasa, Box, Flickr, Imgur and many more. When the image is uploaded, the shared URL is copied to the clipboard for quick sharing on social networks. There’s a useful timer mode that will auto-capture screenshots of the selected region on your desktop after ‘n’ seconds and will then upload them to your favorite destination. ShareX also includes a screen recorder and the screencasts can be either saved as video (MP4) files or as animated GIFs. You can modify the default capture frame rate (FPS) to achieve a balance between the video quality and the video file size. Checkout Bug shooting, Snap Crab or SnipDock. My favorite is Gadwin Printscreen, mainly because it's very simple to setup and use, and because it has some nicely implemented features like cropping the screen before saving it. Features include saving the screenshots to some pre-defined folder, copying to clipboard and choosing image format and quality. Bilderman is a lightweight (1-2 MB) portable screenshot application that will save a bunch of screenshots in the background with just a quick transparent popup confirmation. I've kept it in my Dropbox through Windows XP and 7. Right-click > Show or Double-click to open its window and set the save folder and shortcut keys (for three types of screenshot). Right-click > Open folder to open the save folder. Right-click > Exit or close the window to shut it off, freeing the shortcut keys. To hide the window without shutting the program off, minimize it, e.g., using the "Mini-me" button. Note. It only saves to .PNG and the shot cannot really be customized much. I use LightShot which is free, works with Mac & Windows and is triggered by pressing PrintScreen. Below is a screen shot of it in action. Part of the reason why LightShot is awesome is because you can select how much of the screen gets captured. Once you select your screenshot you can annotate it with a plethora of options. And then when you're finished you can save it locally or upload it to the web. ScreenHunter is my recommendation. You can press F6 (by default, you can change this) and you can capture a rectangular area. It can save the capture as a file or just to the clipboard, include/exclude cursor. I use the free version, but the pro version allows you to capture a fixed area (if you need to take screenshots of similar objects quickly...e.g. 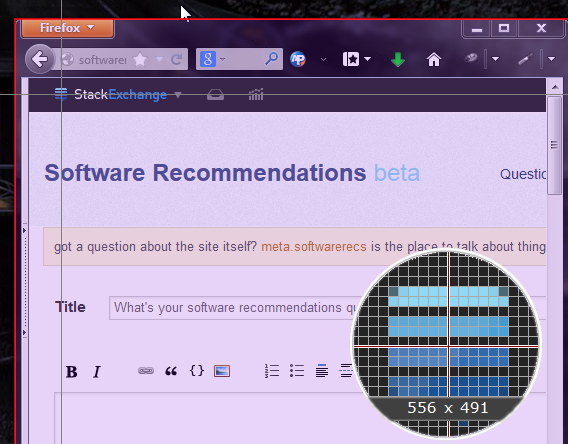 you want the same size/shape capture of different pictures in an album), of a window, an entire webpage (even areas not visible), active window, a specified window, full screen, video screen, webcam or even a shape...basically anything you can think of. Hyperdesktop allows you to take a screenshot of the whole desktop, currently active window or an area of the screen that you choose with your mouse. There are (unsurprisingly) three fully customizable hotkeys to do all of these. The best part for me is that it also allows me to instantly upload the screenshot to Imgur or an FTP server of my choice and edit it before I do. There are two downsides to it that I have with it so far: the website has been down for weeks (you might need to google for a mirror) and you can't capture right-click menus and the top menus (file, edit, view, etc) with it. Hope I'm not too late to the party, I made a quick AutoIt program that makes it easy to specify the hotkey and easy to choose the default directory for saving images. No annoying popups or save windows, just click the hotkey and done. Flamory will take a screenshot of active window on a keypress and save it to the library with no additional prompts. You can later edit it and paste it to a folder or directly into email or document. Original image will be preserved, so you can re-edit it at any time. There is a built-in search that can find screenshots by window title. And, if you made a screenshot of a web page or document, you can actually find it by any word from that page or document. Even if they are not in the screenshot itself. Their Screenshot Library with Flamory post describes this in more details. Flamory runs on Windows and is free for personal use. irfanview is one tool you can use. It is free (for non-commercial use) . change the hotkey or use the default "Ctrl+F11"
Not the answer you're looking for? Browse other questions tagged windows gratis screenshot or ask your own question. Windows 10 Snipping Tool replacement for immediate snip?